Located only one hour south of Barcelona, the Mediterranean wine region of Penedès is a lovely one day excursion from the heart of the bustling Catalan city. Most famous on a worldwide level for the Cava (bubbly) made here, Penedès is also home to some stellar dry reds and whites, and indeed some neat dessert wines. Most of the historic wine estates are located on “Masias” (Catalan farmhouses) and some examples of fantastic properties would include Parés Baltà, Can Feixes, Mas Comtal, and Can Ràfols dels Caus. Other fine producers in stylish, modern cellars include Jean Leon, Agustí Torelló Mata and Raventos i Blanc, and of course the hugely popular Miguel Torres. And while the region is in easy distance of Barcelona, if you are a wine lover, you would thoroughly enjoy a Penedes Wine Tour, spending a few nights here right in the vines, for instance at the new five star Cava & Hotel Mastinell and the Can Bonastre wine and spa resort, also set in vines. While international varietals like Cabernet Sauvignon, Merlot and Chardonnay are commonly grown here there are also neat local grapes like the white Parellada and Xarel.lo and the red Monastrell and Samsó. 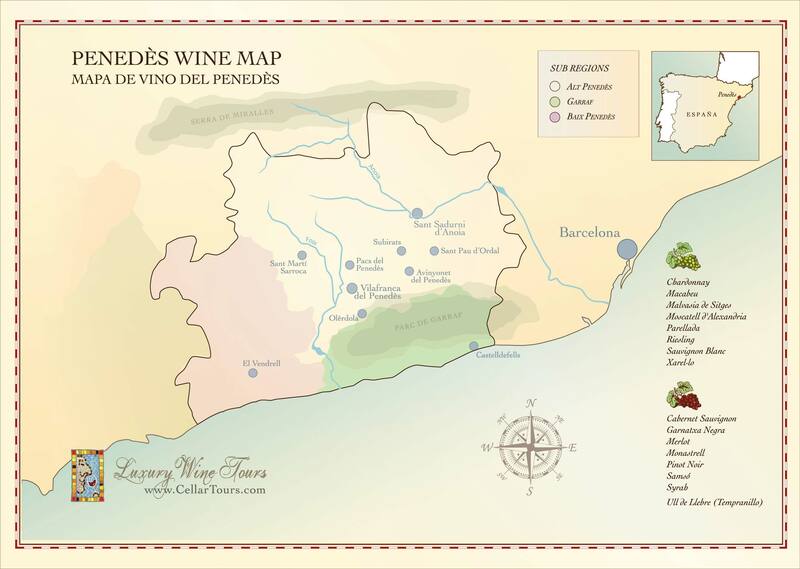 Embed Penedès Wine Region Map on your site: copy and paste the code below.